CAPSULE REPORT: Need more fiber? Don’t like the less tasty options? Gnu Foods has the solution: tasty energy-type bars that provide 12g of fiber for regularity and heart health. That’s almost 50% of your Daily Value of fiber and they taste great, too— appealing to adults and kids alike. A much better choice than that bagel or breakfast pastry, Gnu Flavor & Fiber Bars are also kosher. Functional foods are those that serve a helpful effect on the body beyond normal satiation and nutrition. So when you have a delicious breakfast or snack bar that has almost 50% of the Daily Value of Fiber, it counts as a functional food. Fiber promotes natural regularity and digestive health. It helps lowers cholesterol, so is part of a heart-healthy diet. It absorbs and helps eliminate toxins from the body. And it helps maintain a healthy weight by making us feel fuller longer. In the past, when we have needed fiber in our diet, none of the choices was as tasty as the aptly-named Gnu Flavor & Fiber bar. One Gnu Bar a day gives you 12 grams of seriously good-for-you soluble and insoluble fiber. The bars are low in fat and just 130 calories. The bars are made of organic whole wheat flour, oats, wheat bran, psyllium (a plant with more than 12 times the soluble fiber of oat bran), flax, millet and soy flour; they are bound with canola oil, sweetened with fruit juice and flavored with all-natural ingredients. Most flavors have plums and apples in addition to the headline fruit(s). The result is a very moist, chewy and extremely satisfying product that we would enjoy even if we didn’t need the added fiber. The individually wrapped bars are available in four flavors: Banana Walnut, Chocolate Brownie, Cinnamon Raisin and Orange Cranberry. The company has done a wonderful job with flavor development. Banana Walnut has fresh banana flavor and lots of walnuts. Chocolate Brownie does an admirable job of providing delicious chocolate flavor and moist chewiness. Cinnamon Raisin has subtle cinnamon and raisin flavors: Its three showier sisters have more pronounced flavors. It’s still a tasty bar, and it’s the best-seller. Espresso Chip is sure to please coffee lovers—in fact, it’s the perfect snack with a cup of coffee. Lemon Ginger delivers lively lemon flavor with accents of ginger. Orange Cranberry has lively fruit flavor reminiscent of the tasty Thanksgiving orange cranberry relish, with a long finish. Peanut Butter tastes like a PB energy bar. Peanut butter lovers that we are, we frosted it with an extra slick of PB from the jar. 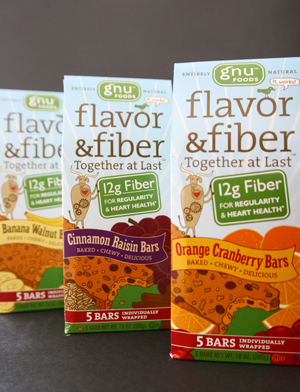 How does a Gnu Flavor & Fiber Bar, with 48% of the Daily Value of Fiber, stack up to other fiber sources? A bowl of All-Bran Cereal has 40% of the Daily Value, and All-Bran bars have half of that. Cheerios cereal or Luna Bars have just 11%. You’d have to drink four eight-ounce glasses of Metamucil to get 14%, six eight-ounce glasses of Orange Citrucel for 8%, eat 4 Metamucil Cinnamon Fiber Wafers for 24% or 12 Benefiber Orange Creme Tablets for 12%. Discuss the options with your healthcare provider, of course. And bring some Gnu Flavor & Fiber Bars so he or she can try them, too. Shipping additional. Prices and flavor availability are verified at publication but are subject to change. Kids will like the personable gnu and his companion, the oxtail bird. Use them as a lesson to explain symbiotic relationships as you try all four flavors.